"The Monuments Men" alternates between a bland bloodlessness that even a couple of cast-member killings can't make moving and director/co-writer George Clooney's usual brand of smirking self-satisfaction that trivializes the based-on-a-true-story subject matter. The movie follows the exploits of seven art experts (two based on real people, the rest largely fictionalized) from various fields whose mission is to track down paintings and sculptures stolen from museums and private collectors by the Nazis during World War II. That task is made more urgent when the Allies learn of an "if we can't have it, nobody can" German memo ordering that all confiscated works of art be destroyed if Der Fuhrer meets his demise. As someone notes in one of the film's most dubious lines of dialog, "We have to hope no one gets Hitler. I never thought I'd say that." Clooney is team leader Frank Stokes, based on the real-life George L. Stout, who headed the US Army's Monuments, Fine Arts and Archives section. Stokes recruits a colorfully unlikely "Ocean's 1944" team that includes Matt Damon as James Granger, based on Metropolitan Museum of Art curator James Rorimer. Their German-born Jewish driver and translator Sam Epstein (Dimitri Leonidas) is based on Harry Ettlinger, who enlisted at 18 after emigrating to America. 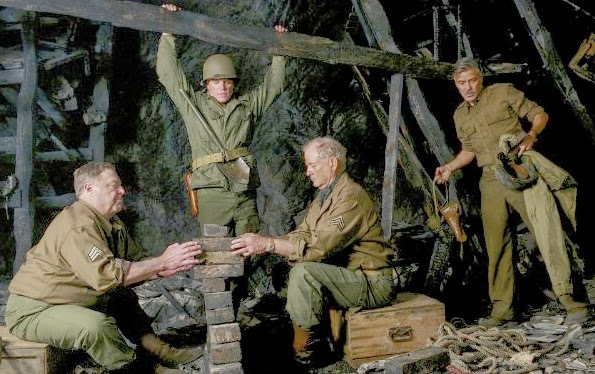 The other Monuments Men are phonied-up "inspired by" constructs apparently designed to attract "Hogan's Heroes" rather than High Renaissance fans. Bill Murray is a deadpan architect with not much to do except defuse a tense situation with a Nazi soldier and get mopey over a Christmas record he receives from his wife. John Goodman is an amiable basset-hound-faced sculptor too dumb to know he's crawling under live bullets during basic training. Jean Dujardin is a French art dealer, Bob Balaban a prickly art historian and Hugh Bonneville a second-chance-seeking alcoholic who provides the film's most mawkish and misplaced attempt at melodrama. The rest of the movie goes wrong by trying to keep things light with Clooney's trademark tongue-in-cheek humor. A scene in which Damon's Granger jokes about standing on a landmine that will explode when he steps off of it is made even more preposterous by the other characters needlessly risking their own lives by refusing to leave his side when he does so. Cate Blanchett delivers the film's best performance as the quietly defiant Claire Simone, based on real-life Frenchwoman Rose Valland, who was the overseer of a Paris museum the Germans used to store stolen artworks for later distribution to various hiding places. Secretly working to undermine Nazi looting by keeping detailed records and supporting the Resistance, she initially mistrusts the Monuments Men's motives as well. That's the closest the movie comes to anything resembling cynicism, however. Although the screenplay mentions Brit bombers that almost destroyed "The Last Supper," has a scene in which an American commanding officer makes it clear that preserving his men's lives is his first priority and includes a dig at Allied generals who care more about gold reserves than cultural treasures, there's no mention of any art-and-architecture outrages committed by Our Side, such as the needless firebombing of Dresden. 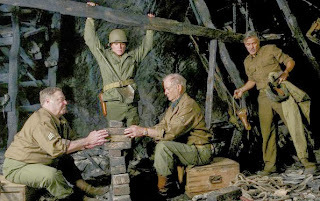 A bit more nobody-is-completely-blameless realism and a less contrived cast of characters may have kept "The Monuments Men" from playing like a dull and dumbed-down "Saving Private Rembrandt" propaganda piece.